Healthy Maple Mustard Chicken is an easy, yummy sheet pan dinner! Paleo, gluten free & ready in under 30 minutes - it's great for meal prep or a quick meal! 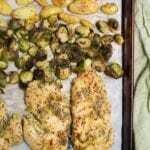 Toss brussels sprouts in the remaining marinade in the bag or bowl + lay along side the chicken on the baking sheet. Lay potatoes on a sheet, spray with olive oil and sprinkle with salt and pepper to taste. Bake at 400 for 25 minutes until chicken starts to brown. You can broil for 2-3 minutes to get a crispier finish if you prefer.